M39 is the result of all the passion Cimbali has for espresso, created to support the professionalism of whom, every day, accepts the challenge of transforming a simple cup into a pleasant moment of relax. 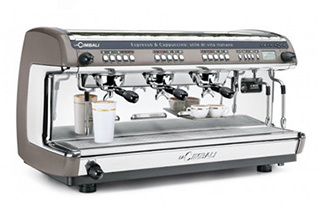 M39 is the ultimate coffee machine as it is elegant, versatile and reliable also under extreme working conditions. The working area is wide in order to simplify access and to easily fit tall cups and pitchers. The graphic display helps to monitor the machine functioning. The boiler is equipped with patented Smart Boiler technology. Furthermore, M39 performs automatic wash cycles. The procedure is guided through the display by simply pushing the specific button.